Heritage Centre News and Updates - 2007. Further Tales at the Pottery"
Two Classic Victorian Stories of Mystery and Suspense performed by Raymond Sargent. "The Withered Arm" is a local premiere as part of the Sting in the Tale Festival! 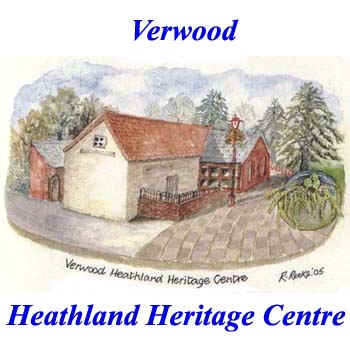 Note that the "verwoodheritage.org" website has been reorganised. verwood.org This site contains Verwood general community Information including the "What's On" page. "Verwood & 3LX" Twinning Association". history.verwood.org This is the site that is aimed at giving information about the history of Verwood including its chronology with reminiscences. Currently these sites are re-directed. verwoodheritage.org Now points to "heritage.verwood.org"
verwoodheritage.net Now points to "heritage.verwood.org"
June 3rd :- The new exhibition is now "Cranborne & Edmondsham", kindly loaned by Chris Bright. The Scouts & Guides display has been retained in the hall. May 22nd :- For a full report (and pictures) on the recent twinning visit by our friends from Champtoceaux then please select the LOGO to visit the Twinning Website. February 24th :- Dorset Family History Society, Woodlands and Verwood Historical Society visited the Centre for another successful event in order to help people Trace their Ancestors. Entry was FREE. February :- Verwood Health Walks now take place every Friday at 09:45 for a 10:00 a.m. start. These walks are organised and lead by rangers of East Dorset Country Management Services (Moors Valley) and are FREE though you will be required to wear suitable clothing and register, please bring along some change for a cuppa at the end of the walk. "Walking the Way to Health" is a National Scheme supported by the British Heart Foundation and Natural England to encourage people to walk more for the benefit of their health. Note:- that Health Walks also occur in Wimborne, Moors Valley and Avon Valley Country Parks. Please visit the Website (http://www.moors-valley.co.uk) for further information, Leaflets can also be picked up at the Heritage Centre. February :- The new Exhibition "Verwood Youth Activities" opened.